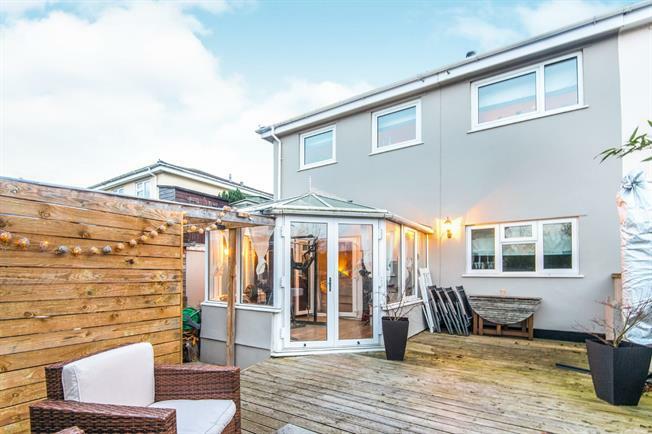 3 Bedroom Semi Detached House For Sale in Axminster for Asking Price £240,000. The current owners have extended the property to provide three bedrooms, a spacious living room and a kitchen with separate UTILITY room. The master bedroom benefits from an ENSUITE shower room and there is a further family bathroom on the ground floor. A CONSERVATORY has been added to provide versatile living space. To the rear this is an enclosed garden which has been fitted with decking, and leads to a gated CAR PORT. Viewing of this property is highly recommended to appreciate the spacious accommodation on offer. Double glazed window to front aspect, fitted double wardrobe, radiator and ceiling light point. Featuring fully tiled walls an a modern white suite comprising of low level WC, vanity unit with wash basin and mixer tap over, and a Phoenix whirlpool bath. Heated towel rail. With double glazed doors and windows to the front and rear aspects, space and plumbing for a washing machine and space for American style fridge freezer, tiled floor and ceiling light point. Double glazed windows to each side, double doors opening to the garden. With double glaze window to the rear aspect, built in wardrobe radiator and ceiling light point. The front garden is mainly laid to lawn, whilst the rear garden has been fitted with decking. An entrance gives access to the gated carport, and a range of useful timber built sheds.